Each year during Women’s History Month, the Ely Center of Contemporary Art (ECOCA) showcases In Grace We Trust, an exhibition that commemorates the philanthropic work of Grace T. Ely. In Grace We Trust addresses ideas of tradition and change — a nod to the past as we confront current societal challenges, and rise together to create our future narratives. This year, ECOCA is collaborating with Nasty Women Connecticut for the group show Silence Breakers. We invite artists working across disciplines, to create artwork that addresses issues of abuse, consent, and identity as well as themes of domesticity and home. The show will look at the often-blurred line between security and insecurity in the home, providing room to explore ideas around gender, equity, sexuality, individuality, and domestic life. Throughout the month of March, the Ely Center will host a series of related public programming, including a panel discussion moderated by Planned Parenthood of Southern New England, performances, film screenings, workshops, and artists talks. Interested artists can submit application with the two forms below. All submitted work will be included in the exhibition—space providing! Artists may submit up to three works (these must be single pieces e.g. if you have a triptych of paintings you must submit them as individual submissions). Use the link below to submit $20 for each submission. Email a high-quality, high-resolution jpg for each submission along with your resume to info@elycenter.org. Please use the same name and email used on your application and use “silence-breakers” in the subject line. Bring a printout of your bio, resume to add to the exhibition binder. Fill out, sign, and submit the Release of Liability to the right. Proceeds from work sold during Silence Breakers will go to Planned Parenthood of Southern New England. If you decide to sell your work, we ask that you designate whether you would like to donate either a portion or all of the sale to Planned Parenthood Southern New England. Please choose from the three options in the Application Form. If you would like to volunteer your time in exchange for the entry fee, send an email using our contact form. Please use volunteer-silence breakers in the subject line. 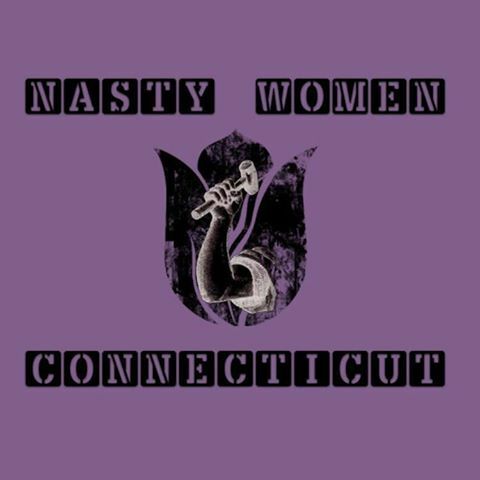 Nasty Women Connecticut will be publishing a catalog of the exhibition and information about it is forthcoming. Artist/Curator (Exhibitor), its employees, agents, successors and assigns (identified below) (“Artist”) grants permission to the Friends of John Slade Ely House of Contemporary Art, Inc., (Friends) its officers, directors, employees, agents and assigns (“Ely Center”) to reproduce his/her name, information describing the Exhibitor’s, work, representations of the Exhibitor’s work and any other information the Exhibitor has provided for the purpose of display, promotion and publicity either now or in the future on the terms and conditions set forth below (“Agreement”). The Artist agrees to display, pack, transport and provide for the return of the Artist’s artwork at the Artist’s sole risk, cost and expense. If the Exhibitor is not available on-site at the appropriate time to display, unpack, re-pack or re-transport the Exhibitor’s artwork, the Exhibitor hereby gives permission to the Ely Center to undertake any or all such activities on the Exhibitor’s behalf and the Exhibitor agrees to pay or reimburse the Ely Center for the reasonable value of the services rendered. Artworks left over 30 days after the date for final removal shall be kept in storage at the Exhibitor’s sole risk, with storage fees of $5 per day applied and if left over 60 days shall become the property of the Ely Center, without compensation being due. The Friends shall not be liable for any injury to the Exhibitor’s artwork, equipment or other personal property arising out of the above exhibitions/displays, the mounting and/or any other activities involved in the preparation and/or presentation of the exhibitions/displays and the Exhibitor agrees to assume all risk of damage to or loss of the Exhibitor’s artwork from whatever cause. The Exhibitor shall indemnify, save and hold harmless the Ely Center and any participating exhibition venues exhibiting or displaying the Exhibitor’s artwork as a result of this Agreement from any and all claims, demands, causes of action, judgments, liens, losses, costs and expenses, including but not limited to reasonable attorney’s fees, arising from the negligence of the Ely Center. This paragraph shall survive the completion of this Agreement or the earlier termination thereof. The Exhibitor shall be solely and exclusively responsible to insure properly and adequately their artwork and personal property. Neither Party shall assign nor transfer any of its respective rights or obligations under this Agreement without the express prior written consent of the other Party and any attempt to do so shall be void and of no effect. All donations collected in donation box belongs to ECOCA. Special events scheduled during the exhibition may raise funds for outside organizations. Waiver by either party of any provision of this Agreement at any one time shall not operate or be construed as a waiver of any provision by such party at any time thereafter. The nullity of any provision hereunder shall not affect the validity or enforceability of the remaining provisions hereunder of the Agreement, which shall survive. Any dispute that arises hereunder, if it cannot be resolved by informal mediation, shall be resolved in a court having jurisdiction in New Haven County, Connecticut. No artwork will be considered for display without this signed form. We would love to include large-scale cross-disciplinary work (space providing). If you would like to show work such as sculptures, video projections, performance, installation, spoken word, etc., please describe the work you would like to present here and we will get back to you shortly. I would like to donate 100% of the proceeds from the sale of my artwork(s) to Planned Parenthood of Southern New England. I would like to donation 50% of the proceeds to Planned Parenthood of Southern New England and keep 50% for myself. My work will not be for sale. I have read the Submission Guidelines. I have read, understood and agree to the terms, conditions and limits of the Ely Center for Contemporary Art and have read, understand the terms of this Release of Liability Form. I will email a high-quality, high-resolution jpg for each of my submissions and name each according to its title/yourname.jpg and and use "silence-breakers" in the subject line. I will bring a printout of my bio and resume to be included in the exhibition binder.